There's nothing in particular about this postcard that tells you it's an artifact from the 1980s. Printed to commemorate the winery's 25th anniversary, it pictures founders James Hall, Anne Moses, Heather Patz and Donald Patz. 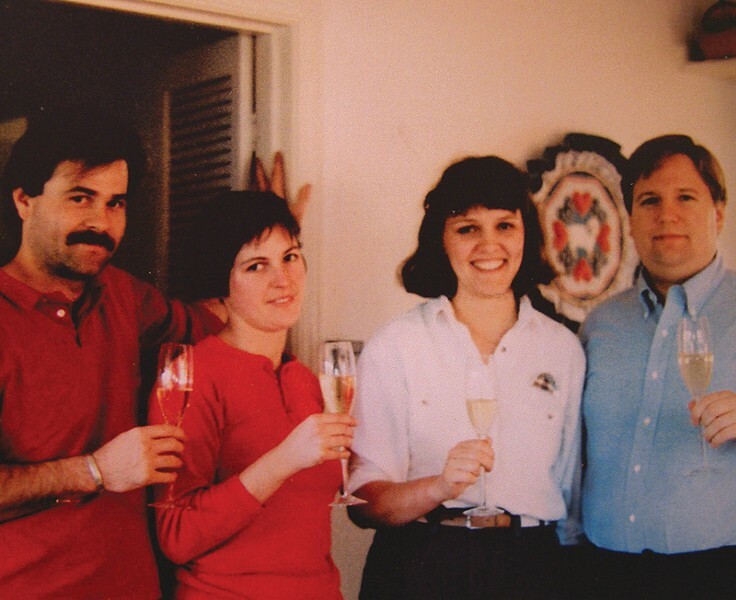 You might still find a mustached winemaker, just like James Hall, today, and as for Heather Patz, well, bangs are in again, are they not? But there's just something about the whole picture that stamps its era. The four friends were Napa Valley newbies, confident and hopeful, when they founded Patz & Hall—provisionally named Project X—in 1988. And with good reason. They've since built a prestigious, 27,000-case operation, which keeps sales director Donald Patz on the horn with distributors nationwide. In their Napa Valley tasting salon, opened in 2007, Heather Patz would like to draw your attention to a different set of photographs. "Being in a corporate park, it's hard to point to the soil," Patz says. "But we can point to the growers." Patz & Hall buys all its fruit from growers. Some of the relationships date to way back when they all used to pile in the car to visit them. Photos of Lee Hudson, Larry Hyde, the Martinelli, Dutton and Pisoni families and others are spot-lit in the salon. "They do respect what we're trying to do," says Patz. Of course, she adds, "We have to pay them well." The salon, all glass partitions inside a Napa Valley business park, required little modification to suit their purposes. Guests are welcomed with a flute of 2010 Brut Sparkling ($38). Drop-ins are accommodated at the bar; sit-downs are presented in the conference room, five wines, five stems. The 2010 Hyde Vineyard Chardonnay's ($58) oak has a spicy, herbal quality, and after a whiff of toasted almond, the wine leaves reluctantly, luxuriating in a sweet texture that exhibits the best of barrel-fermented Chardonnay, viz., not buttery; creamy. I am smelling popcorn in the 2010 Zio Tony Ranch Chardonnay ($60), but it's something like that "hippie popcorn," doused with yeast and herbs, finishing with crisp, limey acidity. The 2010 Chenoweth Ranch Pinot Noir ($58) is rich with brooding fruit, Christmas spice and potpourri; the 2010 Burnside Vineyard Pinot Noir ($70), savory with olive and smoked meat, lush with dry, blueberry fruit; and the 2010 Pisoni Vineyard Pinot Noir ($85), drier and bigger with the blueberries yet. There's nothing in particular that tells you that the price points of these wines range up to the mid $80s. They're subtle, deep and integrated. Indeed, it's the whole picture. Patz & Hall Salon, 851 Napa Valley Corporate Way, Suite A, Napa. Wednesday–Sunday, 10am–4pm. Seated tastings 10:30am, 1pm and 3pm. Tasting fee, $20–$40. 707.265.7700.